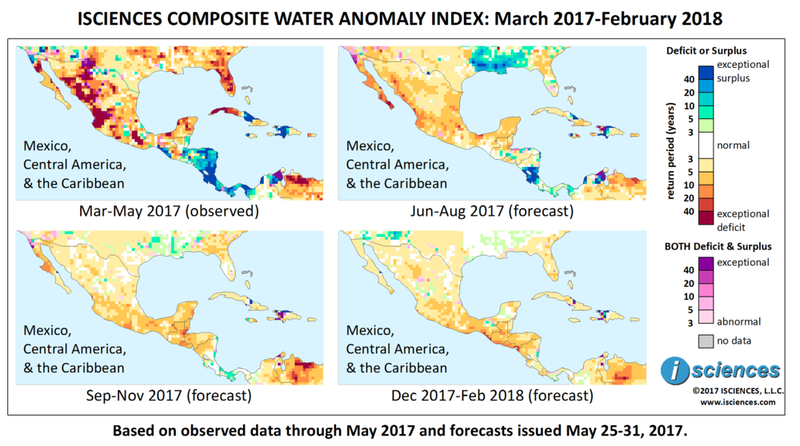 The 12-month forecast ending in February 2018 (below) generally shows moderate drought throughout much of Mexico, El Salvador, and portions of Guatemala. Deficits are expected to be strongest in the northern half of the Baja Peninsula and in a small pocket on Mexico’s central Pacific coast north of Puerto Vallarta. Exceptional surpluses are forecast for eastern Haiti, and moderate to severe surpluses are forecast for southern Nicaragua, northern Costa Rica, and portions of Panama. Partial water shortages are affecting 860,900 Cubans according to an official at the National Institute of Water Resources (INRH - Instituto Nacional de Recursos Hidraulicos). Prolonged meteorological drought has left reservoirs at 38 percent capacity, about 1,400 cubic meters of water less than the average for this time of year. Lake beds in Laguna de las Salinas - a popular saltwater fishing area in Parque Nacional Ciénaga de Zapata on Cuba's southern shore - are normally full from May rains but were parched at mid-month this year. The Ministry of Science, Technology and Environment (CITMA - Ministerio de Ciencia Technologia y Medio Ambiente) reports that the Cuban archipelago has 20 percent less water than in 1990. More than 100,000 Havana residents get their water from cisterns supplied periodically by "pipas," government water trucks. Water from the often unsafe cisterns must be boiled or otherwise purified before drinking to avoid water-borne diseases. Even Cuba's famed cigar industry has suffered over the past several years as the drought has made sowing new tobacco seeds difficult and has left Cubans themselves without cigars on local shelves. A tropical storm in early June along with continued rainfall has brought the water level in Mexico's drought-stricken Oaxacan reservoir at the Benito Juárez dam up from 14 percent capacity to 99.9 percent capacity, prompting officials from CONAGUA, the national water commission, to consider releasing some of the water into the Tehuantepec River. In Zacatecas State, however, the governor is considering cloud-seeding to alleviate dry conditions, and subsistence farmers in Tlaxcala State were unable to sow thousands of hectares of corn due to the drought. The June through August forecast is for moderate to severe drought for most of Mexico, with severe to exceptional water deficits in Baja. Exceptional surpluses are forecast for Costa Rica. Conditions are expected to moderate with longer lead times.